Planning to visit Myanmar soon? Get in line; the political reforms unfolding in the former hermit kingdom has opened the floodgates of tourism into the country. "Now, the whole world actively wants to engage in the country and wants to go there," explains Edwin Briels, general manager of ​Khiri Travel Myanmar and a long-time Myanmar travel professional. "Three years ago, we had to beg people to come!" The increased tourist tide has made only a little difference in Myanmar, the biggest country in mainland Southeast Asia at 261,000 square miles. New arrivals will find none of the crowds they'll usually encounter in more trafficked destinations like Bali and Siem Reap. "There's a lot of space for more people to come, to visit the country," Edwin tells us. "I think it's good if travelers dispersed over Myanmar - don't only go to Mandalay, Bagan, and Inle Lake, but go to Northern Shan State, or Kachin State. And it would be good if people spread out more over the whole year because Myanmar is definitely a destination for the whole year!" Edwin offers a few tips for tourists planning their first journey to Myanmar - to make the most of your own jaunt into Southeast Asia's most mysterious country, take his advice to heart. Many travel guides will advise you to steer clear of Southeast Asia during the monsoon season between June and October. They don't tell you, though, that the beginning of the monsoon season may be one of the best times to see Myanmar. "I think it's one of the country's best-kept secrets - traveling in July and August," Edwin explains. "It is a bit cheaper, and it's when the people are in a good mood, because it's the rainy season and it's the Buddhist Lent. [It's] beautiful, it's very green, much cooler than it is [during the summer]." Some essential infrastructure upgrades have taken care of old problems: "I know that some travel books in the past say there are problems with accessibility by the roads, etc., [but] that's all gone; all the roads are fine," Edwin says. The southern parts of Myanmar take the brunt of the rain during the monsoon season, so Yangon may be quite soaked at this time of year (the capital averages between 19-21 inches of rain between June and August). The northern parts - including Mandalay, Inle Lake, and Bagan - receive only an average of 3-5 inches of rain during the same period. What rain takes place is hardly what you would call Biblical in scale: "On average, it's less than half the days that it rains a bit, that it rains at all," says Edwin. "Half of the day it's dry, the other half, when it rains, it's mostly at the end of the day." The rains do come, though, so pack properly for the season. At last count, there were about 11 Myanmar airlines operating domestic routes, among them Myanmar National Airlines (the country's flag-carrier), Golden Myanmar Airlines (Myanmar's only low-cost carrier), Yangon Airways, Air Mandalay, Air Bagan, Asian Wings Airline, Air KBZ, and Myanmar Airways International. For Edwin, the air situation in Myanmar is stable and safe overall, thanks to the consistent oversight by the Myanmar Department of Civil Aviation and International manufacturers like ATR. "[An airline is likely safe] if you are allowed to land in Singapore - I'm sure that Singapore has very high standards!" When Edwin books flights for his clients, he makes his decisions "based on reliability" - the bigger the fleet an airline possesses, the more stock he places on their operations. "You have some of the airlines who have two or three aircraft - the moment that one of the aircraft is unserviceable, it means that the airline has to cancel 50% of their flights!" This is less likely to happen with airlines that have larger fleets on hand - "if they need to cancel, they'll have sufficient other aircraft [to take over]," Edwin says. Read more about Myanmar's airports, along with our guide to flying in and around Myanmar. Ngapali Beach Is "Better Than Phuket"
Planning to visit Myanmar during the summer season? Book a berth at Ngapali Beach - you'll need to do it way in advance, but it'll be worth it. "It's the most beautiful beach, [with] crystal-clear water, white sand, [and] palm trees waving on the sides," explains Edwin. "What makes it special is the lack of things like 7-Elevens, karaoke bars, souvenir shops, etc.," Edwin says. "Ngapali just has low-rise hotels which are directly accessed to the beach. Behind the hotels, there's a small road, and there are a few local seafood restaurants, and that's it! It's about the beach and nature, great people, good food, without the whole tourist circus that you have in other beaches!" The hotels and resorts along Ngapali Beach are of high quality, mainly boutique hotels ranging from three to five stars. "It's certainly not a hippie destination; it's more high-end," Edwin explains, but it's all about the bang for one's buck, which Ngapali Beach delivers in spades. A comparison with Phuket in Thailand, for example, illustrates his point. "If you're looking for a hotel right on the beach - which I think is always ideal, where you just walk onto the sea - there's not a lot of places on Phuket where you have a hotel right on the beach," Edwin explains. "But if you compare prices of Ngapali Beach's boutique resorts to those on Phuket, Myanmar offers great value for money." Expect plenty of competition for rooms - "it's difficult to find a room during peak season - March, April May is ideal for traveling to the beach," Edwin explains. "Even during New Year's Eve, but that's the same in Phuket or Luang Prabang, it's not just typical of Myanmar!" Buzz aside, there's still plenty of room for tourists to roam in Myanmar. "I think that the increase is not as high as it's sometimes put in the media," Edwin tells us. "In percentage points, the number of tourists is increasing. 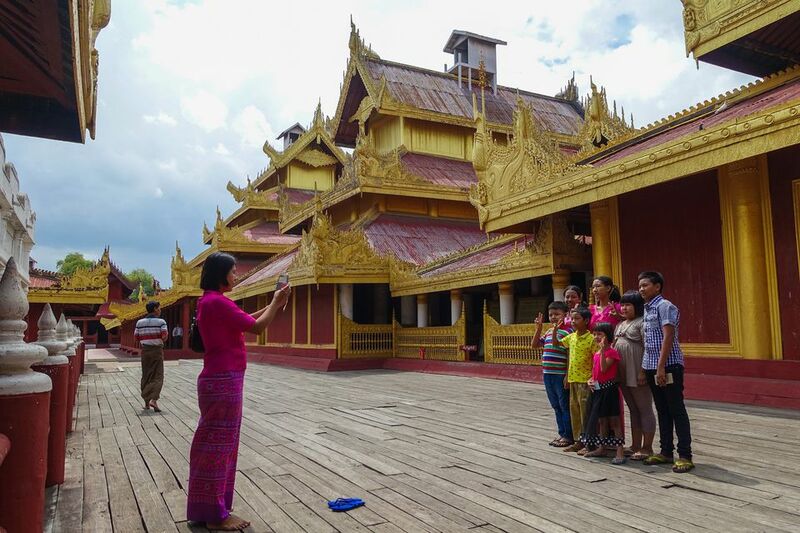 But if you look at the actual number of tourists, it's still very low - Bagan still gets 250,000 tourists a year; which is nothing compared to Cambodia or Laos." Bagan's low tourist uptake - for now - makes this temple town an appealing destination for the off-the-beaten-path wanderer and the budget traveler (read about Myanmar money). "Even in the high season, there's a lot of temples where there's nobody [around]," says Edwin. "I like it more than Angkor Wat - Bagan is great to take a bike or horse cart and see all the scenery of temples, stop where you like to stop and explore." What Prepaid Cellular SIM should You Buy in Myanmar? What Myanmar airport should you fly into: Yangon or Mandalay? Don't Worry: Food and Beer Are Still Cheap in Myanmar!